Synopsis (From Goodreads): Since she’d been on the outside, she’d survived an Aether storm, she’d had a knife held to her throat, and she’d seen men murdered. This was worse. Er, ok, I’ll stop. Sorry. 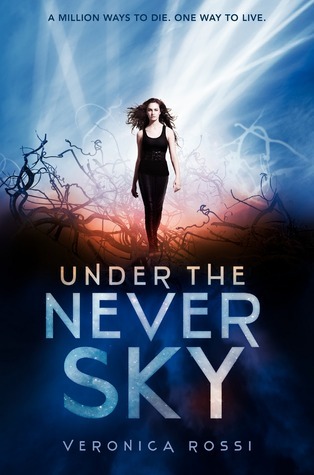 Under the Never Sky, a post-apocalyptic dystopian debut novel, promised me big things. “…If the cannibals don’t get her, the violent electrified energy storms will.” and “Their unlikely alliance forges a bond that will determine the fate of all who live under the never sky.” It sounds like a whole bunch of yay, and my excitement was bubbly and joyful. And then, well, I read the book. Don’t get me wrong; Under the Never Sky was not the worst book I’ve read this year. It just wasn’t that great, either. I’m kind of neutral on it, even though my hopes were dashed apart and scattered on the wind. There’s so many things that I need answered. What, exactly, is aether? I know it’s described as “electrified energy” and makes lightning-like strikes happen in horrible storms that mainly occur during the winter months, but…why? What IS it? What caused it? Are there ways to harness such a fantastic source of energy? Aside for the aether questions, there’s the typical YA Dystopian lack-of-world-building going on in general and I just don’t get why things are the way they are, why they stay the way they are, and what people are planning to do about making things change…or stay the same…considering things are apparently failing in different parts of the world. Then there’s the characters. Perry saves Aria multiple times, but she doesn’t seem to really pay that any mind. At some point, though, the switch is flipped and OMGOMGOMG we are in LOVE. It is fast & furious at that point. Ugh…entirely unbelievable. Aria is -annoying- in her naiveté. Her personal section of the story is rife with I’m-too-stupid-too-care-about-my-safety actions.. We’re told she has some sort of sense of self preservation, but she’s obviously absolutely incapable of helping herself, as we find that Perry and others have to get her out of tight spots repeatedly. She’s also just plain boring. I think her personality needs a bit of a pep talk. At any rate, I will be reading the next in the series, because despite my ‘meh’ feeling about this one, I am interested enough to find out what happens next. And I do hope that Rossi expands upon and explains some things about her world – it seems like it could be such a COOL place! FYI: The “fate of all who live under the never sky” is not determined in this book. You’ll need to read the next one for that, or possibly the one after that – considering it’s a proposed trilogy. Hmmmmm, this book didn’t work for me either and I usually enjoy dystopian/post-apocalyptic lit. Although, maybe the word ‘lit’ is the problem. I didn’t think it was very well written, the language uninspiring and the dialogue wooden. I couldn’t finish it – so well done you, for plowing through to the end!